Linda Nagata was born Linda Webb November 7, 1960 in San Diego CA. She and her family moved to the Hawaiian Island of Oahu when she was ten, and she graduated from the University of Hawaii with a Bachelor's Degree in zoology in 1982. Not long after that she married Ron Nagata. They have two children, a daughter 13 and a son 11. Her first published story ''Spectral Expectations'', appeared in Analog in 1987. 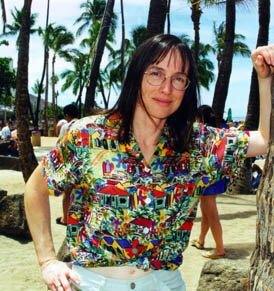 She won the Locus Award for Best First Novel with The Bohr Maker (1995); her second novel, Tech-Heaven, came out that same year, followed by Deception Well (1997) and its sequel, Vast (1999). Limit of Vision will be published in March 2001. ''I live in Hawaii, though I rarely write about it – but that doesn't mean it doesn't influence my books. Grim things happen in my stories, and I don't write about ideal places, ideal worlds, but in the end, I think my work has a positive outlook, and some of that has to come from living on Maui. I have one of the most gorgeous drives to work in the world. It's hard to stay pessimistic – it would be ungrateful, really – while living here." ''The excuse for the LOVs' existence was they were developed to be a biological prosthetic, a means to treat certain brain diseases, but it wasn't long before their development was pursued because it made for fascinating science. Eventually they are adapted to be symbiotic with humans, so their neurostructure and the human brain blend into a single system. The people who do this, the protagonists, find they get an extreme benefit out of it. They feel more emotionally aware, more interested in the world, more in control of the way they feel about things. ''This is something that has interested me since the days of Star Trek. We have this image of the logical, the very intelligent mind – that if you strip away emotions, you can think clearly. But to me, that's exactly the opposite of reality. When you're deeply, emotionally involved in something, you tend to think better, clearer, you're much more intense about what you're doing, you get farther, and you enjoy what you're doing. That's the feeling the people in the book get when they interact with these LOVs. Interaction makes them more human. It brings a far deeper meaning to their lives. Of course, opposed to them are people who are terrified of the entire prospect – a rational terror, to be sure. At the same time, there are many other political ambitions added to the mix, because human societies rarely act immediately and rationally." ''The book I'm working on now got started because I wanted to do something really different – different for me, anyway. I decided I would try my hand at writing a fantasy. So I sat down and started plotting it out, and within about two hours it turned into a science fiction novel. It's working title is Memory and it's set in the far-future, on an artificial world, which has become a sub-genre of its own these days. Memory is much more human in scale than many of my books have been. The people in it are a simpler people, and yet they have their own technology – which is, of course, related to nanotechnology, but with a completely different philosophy behind it. In a sense, Memory is a classic adventure. I want it to feel like fantasy – to have that emotional resonance – but to work like a science fiction novel." ''It's a popular pastime to knock the society in which we live, and it certainly is far from perfect, but I still believe my children are growing up in a far better world than I grew up in. Sure there's violence, there's profanity – there always has been. But children today don't have the threat of a nuclear war hanging over their heads, and they're living in a world where – at least here in Hawaii – the fact that they're half-Japanese and half-Caucasian makes no difference whatsoever. It's a much more civilized world, and it's going in the right direction."